First Friday, downtown Las Vegas. Shot sometime between the days of downtown being near empty after 5pm, and today where there are spots with staying power on into the night. Disposable income. This shot was taken pre-2008 with an estimate, at that time, of around 35 million visitors a year to Las Vegas. Last year there were over 40 million visitors, but they are spending less. Our facade in the desert continues. The photo also documents what was a suggestion of an appropriate streetscape (trees have been replanted with smaller/younger specimens) that provided for walking in our summer months (the area occupies only a 160′ stretch of a 2500′ block and a 5000′ super block). Too bad the guardrail on the planter was placed at the outer edge of the bench. Go ahead and stand a minute (see showtimes), but please move on inside and spend some money if you want to sit..
Boulder – Hoover – Boulder – Hoover. My own sweep of the leeward side. 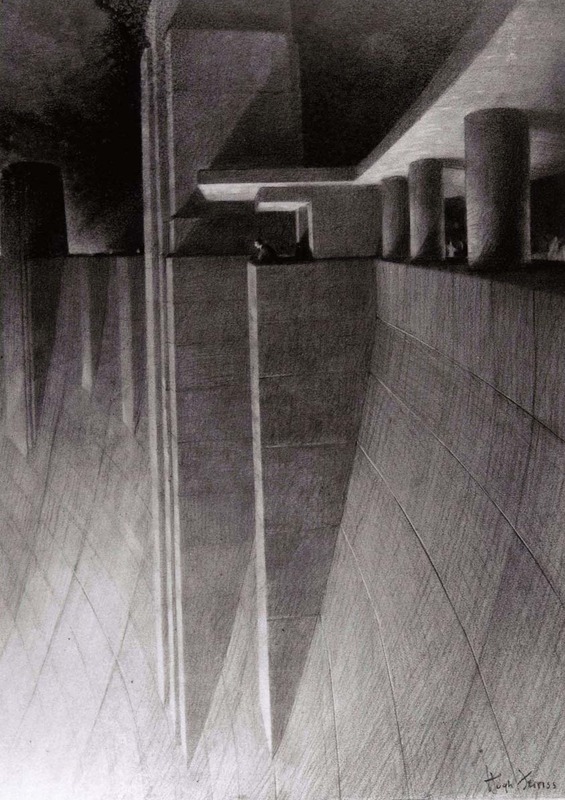 Check out a plan/map and section to get a technical idea of how massive the dam really is. Also check out a cool rendering (partial elevation). http://paulfenkell.com/wp-content/uploads/2016/02/Fenkell-logo3.png 0 0 Paul http://paulfenkell.com/wp-content/uploads/2016/02/Fenkell-logo3.png Paul2012-03-27 04:46:552012-04-26 10:58:07Boulder - Hoover - Boulder - Hoover. This theater caught my attention many times as I traveled by. It stood just outside Fallon, Nevada. Luckily, I finally stopped and got a picture before it was demolished. Fremont Street sometime around the year ’00. One of my favorite facades. I live here in the desert. And while this is not a picture of my house, I still live under that sign. Everyone in this valley lives under that sign. It is part of the lure of Las Vegas. A sense that anything goes in this town. A siren song that calls some 40 plus million visitors a year to a place with no natural landmark, no port of call, no major export, and no ocean view. Tourists may not be spending as much here these days, but they are still coming. Tourists may still be a good bet in the short term; however, if you plan to stay at the table, then you must have one eye on the water supply. When I ask, “What brought you here?” I hear a lot about opportunity, easy living, and relatively low taxes. Ever get a few extra stir sticks in your cocktail? Hey bonus! Odds are you won’t even notice three straws in the lake. Me? I’m here because leaving is simply not an option. So if here, then I will work to make this place the best it can be in face of it all, and hope the day doesn’t come when fate starts dealing me cards so dry and dusty that I know I should fold, because that too is not an option.